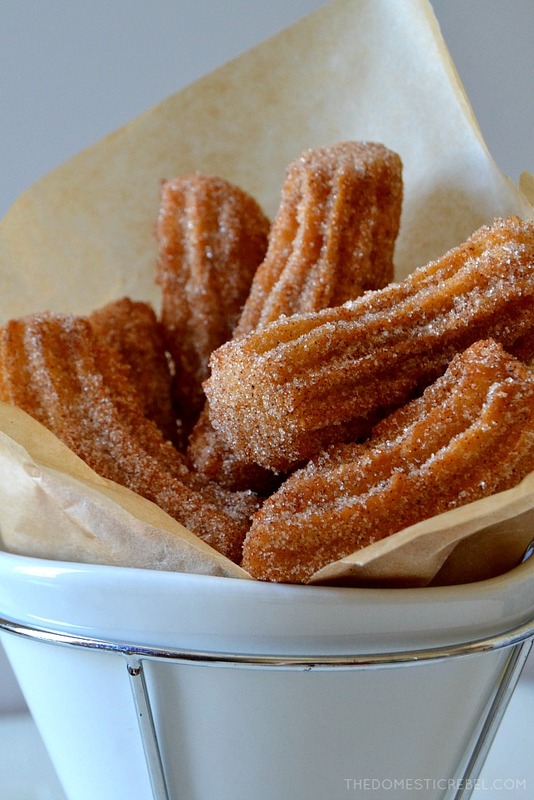 These Perfect Homemade Churros are easy, quick, and taste just like a street-cart churro! Crispy outside with a fluffy, soft interior and lots of cinnamon and sugar! I am a cinnamon-sugar fiend. Of all the flavors of desserts, cinnamon sugar must be my top favorite. I could probably eat a flip flop if it was dredged in a thick coating of cinnamon sugar. Okay, not really… but I am passionate about my love affair with cinnamon sugar! 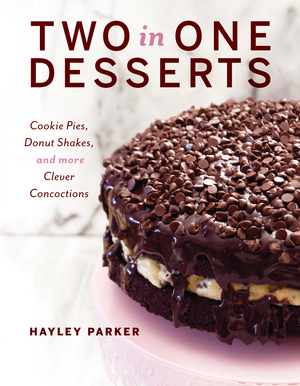 It all started with my beloved mom, who has an equal love affair with this flavor combo. As a kid, she’d make me cinnamon sugar toast or heat me up some brown sugar & cinnamon Pop Tarts for breakfast. We sometimes had cereal for dinner growing up when I was too tired from school to cook, so my pick was always Cinnamon Toast Crunch. And whenever we’d make the trip down to a certain mouse-themed amusement park, I’d ALWAYS eat my weight in fresh churros! To this day, the humble churro is my fave amusement park snack! There’s just something about the addictive crispy crunch of the exterior of the churro contrasted with the fluffy, light interior that gets me every time – not to mention the fact that cinnamon sugar is the star flavor here. I am a churro purist; I can’t imagine getting Oreo churros or some of those other specialty flavors when the original one is so perfect. And with Cinco de Mayo coming up relatively quickly (okay, so we still have a month and a half but I want to be prepared!) 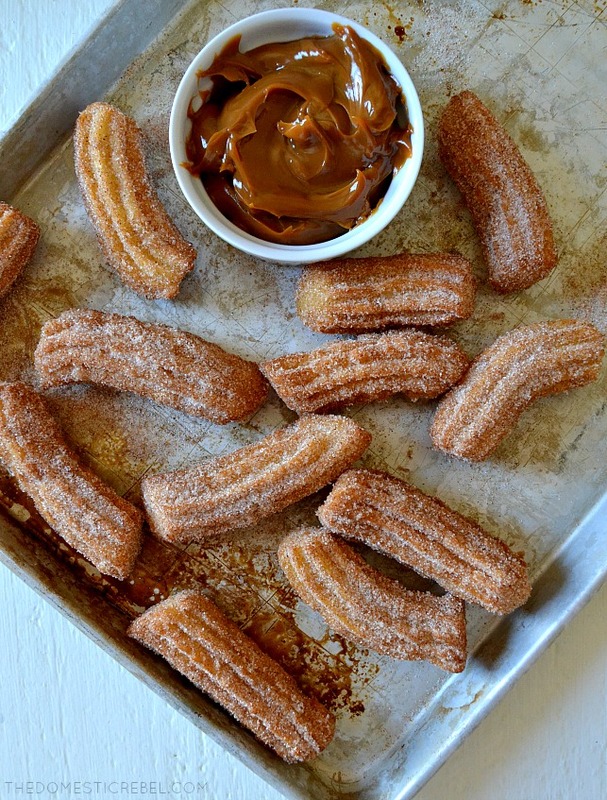 I wanted to post a churro recipe that would get everyone pumped for my fave dessert! 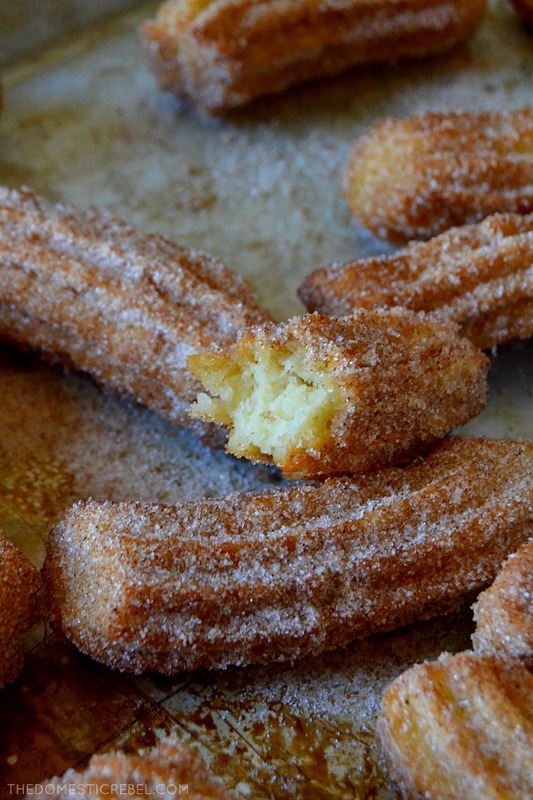 This recipe for Homemade Churros is so simple – trust me. 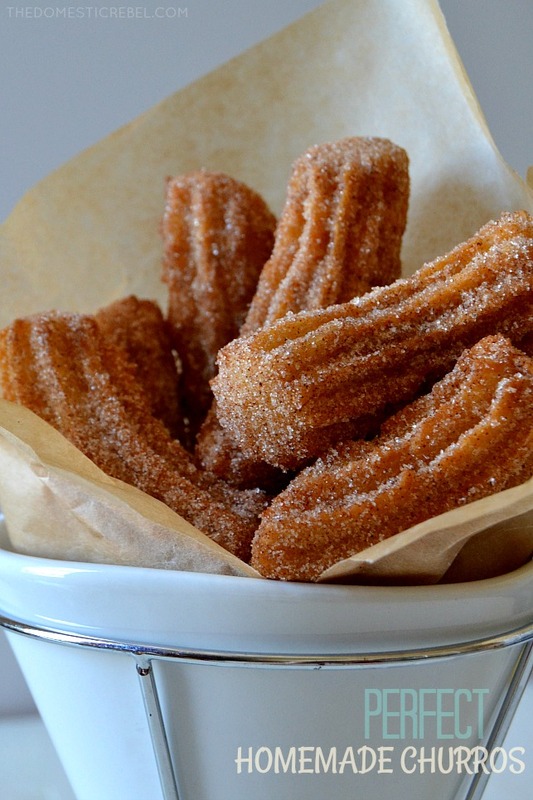 You’ll be a churro expert in no time! The dough starts with some butter, water, and a little sugar and salt. You’ll bring it to a boil over medium-high heat, then turn heat to low and stir in some all-purpose flour. Stir it with a rubber spatula until combined. It may be slightly lumpy, but this is okay. 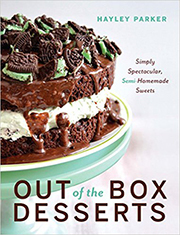 Place the dough into the bowl of a stand mixer and let it cool off for about 5 minutes. While the dough is being made, heat some oil in a large skillet over medium-high heat, until a candy or deep fat thermometer reaches 360 degrees F.
Once the five minutes are up, add in your egg and vanilla and beat it fast and thoroughly for about 1 minute or until the egg is fully incorporated. 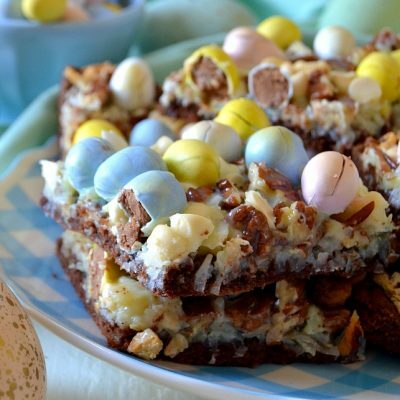 You want to make sure you beat the mixture very well because otherwise the cold egg will hit the hot dough and scramble – not good! The mixture may look at first like it is separating, but keep mixing – it will all form into a cohesive dough within seconds. Now you’ll fill a pastry bag fitted with an open star or French star tip with the dough. 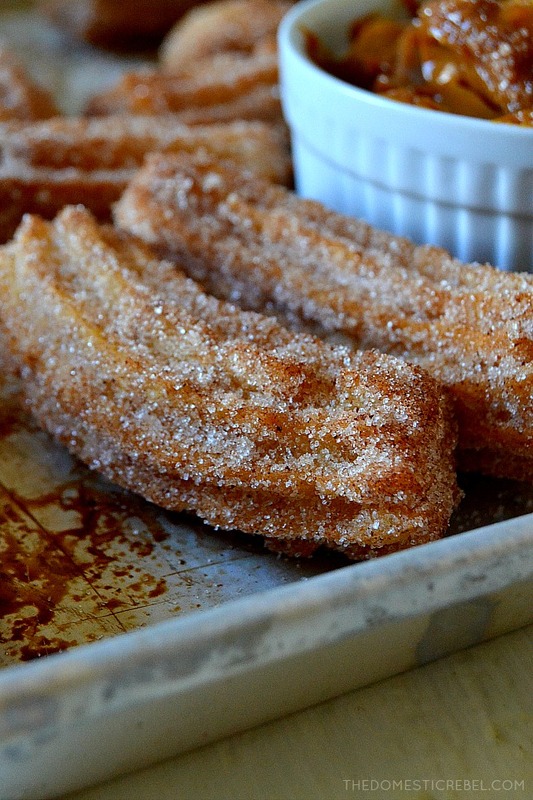 Pipe the dough in 4 to 5-inch long strips, using scissors or a knife to stop the flow of each churro into the hot oil. Let them fry about 2-3 minutes per side until golden brown. I like to test the first churro to ensure the center is cooked through. The center should be soft and fluffy, not wet or too gooey. Let the churros drain on a paper towel-lined plate for about 15-20 seconds, then dredge them in the cinnamon sugar mixture. I like to really coat them well so they’re extra sugary! It’s really as easy as that! Make dough, fry dough, coat in cinnamon sugar. Now who wants a churro!? These Perfect Homemade Churros are light and crispy with a soft interior and lots of delicious cinnamon sugar flavor! I absolutely love how simple they are to make! In a large skillet, heat 1 & ½ inches of vegetable oil over medium/medium-high heat and stick in a candy or deep fat thermometer, heating until it reaches 360 degrees F.
In a loaf pan or small bowl, whisk together the cinnamon sugar coating until combined; set aside. In a medium skillet, combine the cubed butter, water, granulated sugar and salt. Bring to a boil over medium-high heat, then add in the flour and reduce heat to medium-low, cooking and stirring with a rubber spatula until combined and a soft dough forms. It's okay if the dough has some lumps in it. Allow the dough to cool off the heat for 5 minutes. Place dough in the bowl of a stand mixer. Add in the egg and vanilla and beat on medium-high speed until combined and cohesive. Be careful with this step as the hot dough plus a cold egg could easily scramble your egg, so make sure you work quickly! Place the dough into a disposable piping bag attached with a star or French star tip. Pipe 4 to 5-inch long strips of churro dough into the hot oil, using scissors or a knife to cut off each piece. Fry 4 to 5 at a time, gently separating them with tongs if they attach to one another. Fry for about 2-3 minutes per side or until golden brown and crisp. Drain on a paper towel-lined plate for 15-20 seconds, then dredge in the cinnamon sugar mixture. 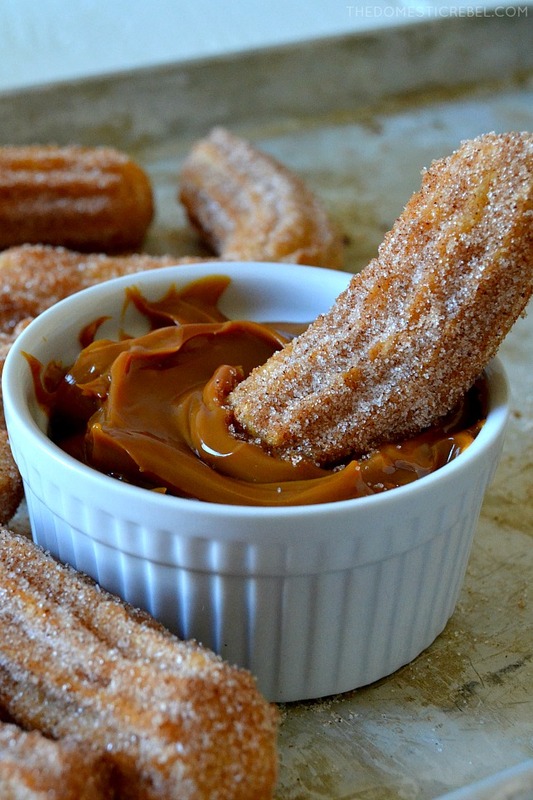 Serve warm with dulce de leche dipping sauce! 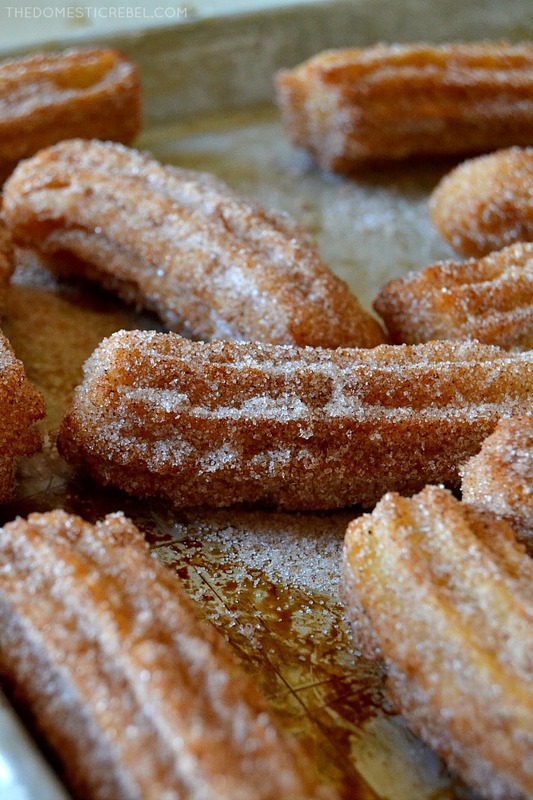 I mean… look at that churro! These are HEAVENLY!